During the summer of 2004, the Institute for Social Policy and Understanding (ISPU) released the results of an extensive study on Detroit metropolitan area mosques. Dr. Ihsan Bagby of the University of Kentucky conducted the study, surveying more than 1,300 participants from twelve different local mosques. An additional thirty-two mosques were also profiled in detail. Focusing on the mosque is important for several reasons. First, understanding the mosque is integral to understanding the American Muslims today since it is the cornerstone of the Muslim community. The study provides valuable information for mosque leaders as well as insight for policymakers to better understand American Muslims and the challenges of the future. Second, the ISPU study of mosques also provides, for the first time, a basis of empirical data for further research into mosque activities in the United States. Finally, by focusing on Muslims that attend the mosque, the study also counters the oftrepeated assertion that mosques are a place of violence and extremism. While the study has given the outside world a rare glimpse into the mosque, it has also served as a tool for Muslim communities and their leaders to strategically plan for the future. Specifically, the trends and demographics identified in the survey highlight important social and religious challenges that American Muslims living in metropolitan areas face. Without adequately understanding and preparing for these challenges, American Muslim leaders and community activists risk becoming irrelevant to their respective constituents. The conclusions drawn from the data collected benefit Muslim communities in other cities. The study data equips community members and policy makers with tools to understand challenges faced by American Muslims in the twenty-first century. This brief overview highlights six major challenges that were discovered from the study. It also examines the impact of these challenges on the development of the American Muslim community over the next decade. 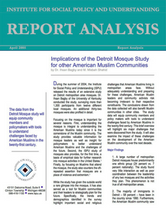 To view the study itself, see The Detroit Mosque Study.